The myHEALTHware organization is your clinic organization that you will use to connect and communication with your patients and colleagues. Enter the name of your clinic. This clinic name will be displayed to your patients and all other myHEALTHware users that you are in communication with using myHEALTHware. Enter a brief description of your clinic. This description will be displayed within your clinic's profile and can be viewed by your patients and other myHEALTHware users that you are connected with. To continue to the next step, please click the following link: Set Up Users and Roles. 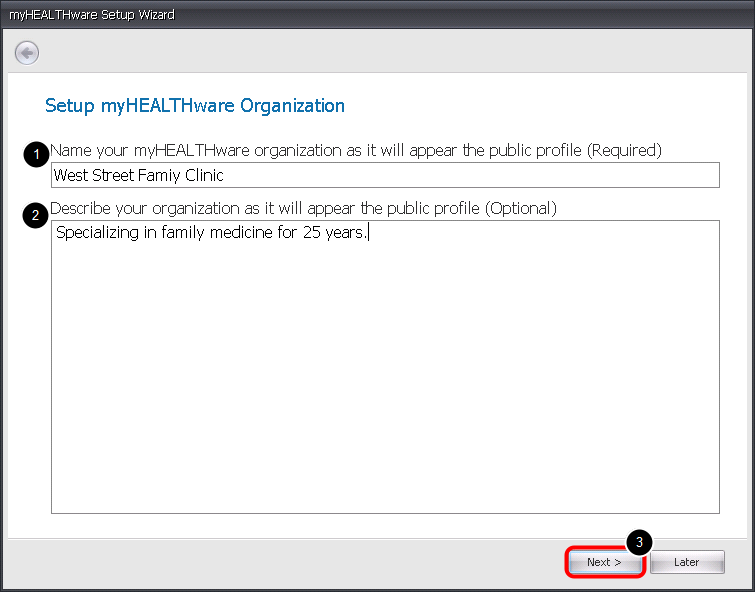 The next step will allow you to set up your staff member's myHEALTHware invitations (to allow them to create their own myHEALTHware accounts) and define roles for each staff member. The roles allow the myHEALTHware administrator to assign certain security privileges to staff members for their use with myHEALTHware. If you are not prepared to set up staff roles at this time, click Later to return to the Setup Wizard at a later time.